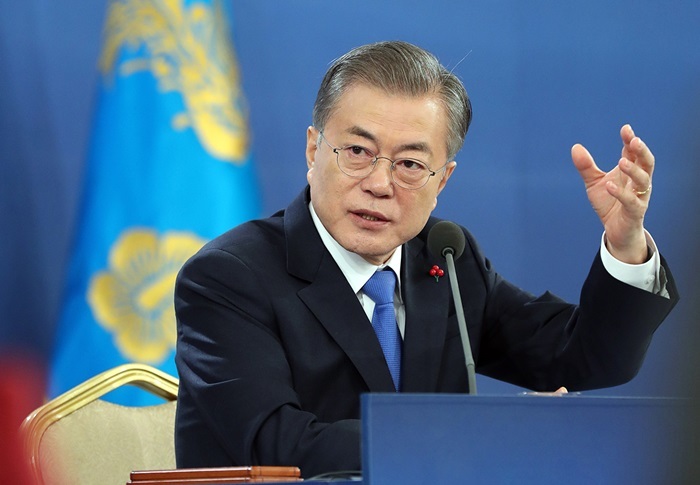 President Moon Jae-in on Jan. 10 speaks in his New Year’s news conference at Cheong Wa Dae. In his New Year’s news conference at Cheong Wa Dae, the president began a Q&A session for both Korean and foreign reporters by answering questions on diplomacy and national security. Of the 24 questions asked of him on the three areas of diplomacy and national security, economy, and politics and society, the most (10) were on the first category. 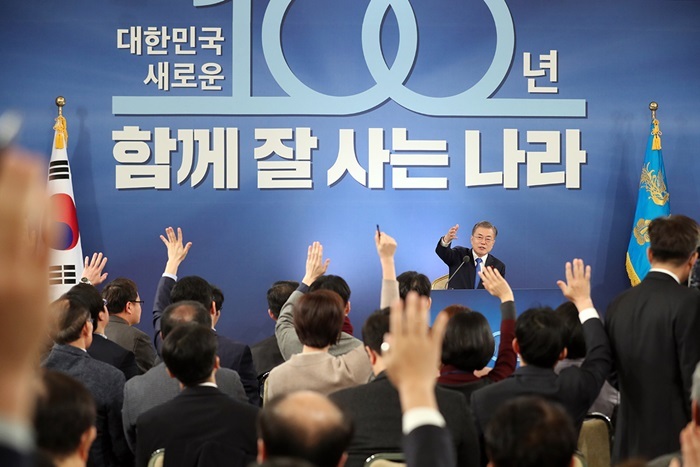 Journalists on Jan. 10 ask questions to President Moon in his New Year’s news conference at Cheong Wa Dae. Touching on the possible agenda for the second North Korea-U.S. summit, he said reciprocal measures by both sides toward the North’s denuclearization will be considered and that unlike in the first summit, where only abstract conclusions were made, specific measures will be discussed in the second meeting. He also mentioned plans for a “peace agreement after denuclearization” signed at an inter-Korean summit last year. The agreement and denuclearization are connected, the president added, and after the final step of denuclearization, a multilateral approach is needed so that all relevant countries can participate in the agreement.